We are fortunate to live in an area that is served by a local dairy farm for home delivery of milk. Great milk comes once a week, fresh to our front door. Fresh milk like this is delicious. In its freshness you can taste the changing grazing diet and the change of the seasons in the cows’ diet. Even though the milk is homogenized, certain times of the year when the cows eat a richer diet, cream sits on top of the milk in each bottle. With a young teenage boy in our house, a lot of milk is consumed. Still, there are times when the week’s allotment of milk is not finished before the new delivery arrives. I have found a number of great ways to use this milk. I tried my hand at making hard cheeses, but it is a lot of work to make a relatively small piece of cheese. Some of the types require hours of stirring and special treatment, only to take on mold in the long aging process. I lost patience in this and have opted instead to make fresh cheeses, such as mozzarella or ricotta, yogurt, and buttermilk. These are all very simple to make, and involve very similar processes. The cheese that I make most often is a lactic cheese. Many people probably never heard of this cheese, but it is worth getting to know. The process to make this cheese is the same as for making chevre, or goat cheese. The difference, of course, is that cow’s milk is used in the lactic cheese as opposed to goat milk. 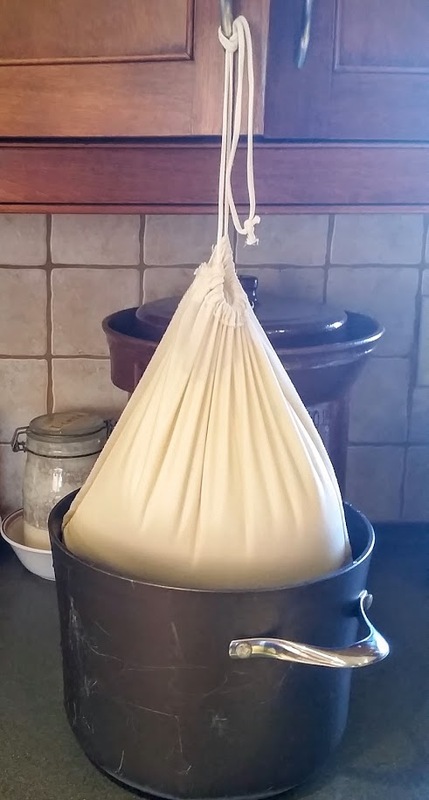 The first cheese I ever made was chevre. I had no idea how easy it was to make cheese. We used to visit the Shenandoah valley in Virginia on weekends, and one of the stops was a farm where a woman had started a small dairy goat enterprise. She made chevre flavored with all sorts of fresh herbs, seeds, and spices. We would stock up. Sadly, the farm stopped making cheese. 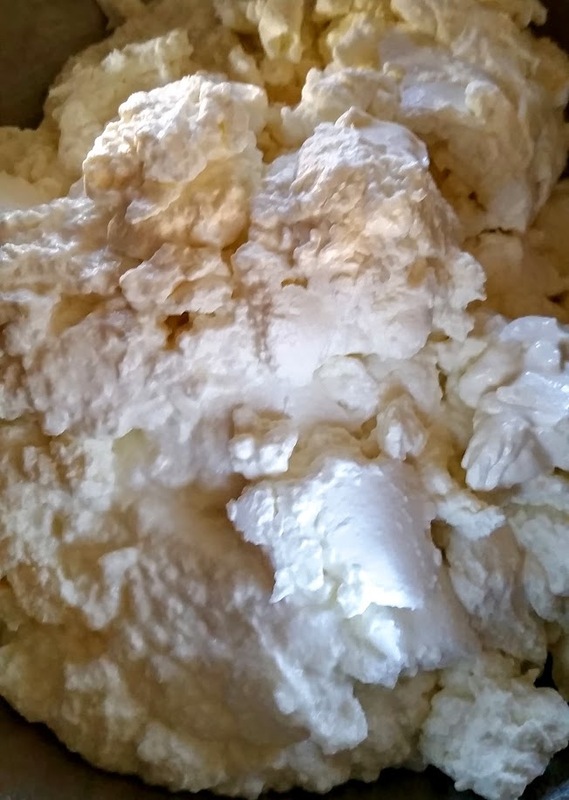 After so many visits to the farm, I thought I could certainly make some chevre if I could find some good goat milk. Then, on a visit to my family in Pennsylvania, my dad said I should come with him to the Amish farm where he buys sweet potato plants. The farmer there had started raising dairy goats and was selling raw goat milk. I got some milk and the supplies to make cheese. One batch and I was hooked. This was so easy, and one gallon of milk made five nice molds of cheese. Back in Virginia, I soon learned about the availability of good home delivered milk, and we started getting our weekly deliveries. Why not make the same milk with cow’s milk instead of goat milk? I gave it a try, and now it is a staple in our home. I learned that this type of cheese is called lactic cheese. It can be made softer or firmed by varying the amount of rennet in the cheese. This cheese has tons of uses, both savory and sweet. For savory uses, include just stirring in some minced garlic chives, smoked paprika and black pepper to use as a dip, my smoked salmon cheese spread uses this cheese, and I use it as a foundation for chili con queso instead of cream cheese. It can be spread on a piece of toast by itself or topped with pepper jelly, apple butter, or just a few thin slices of garden fresh jalapeno. 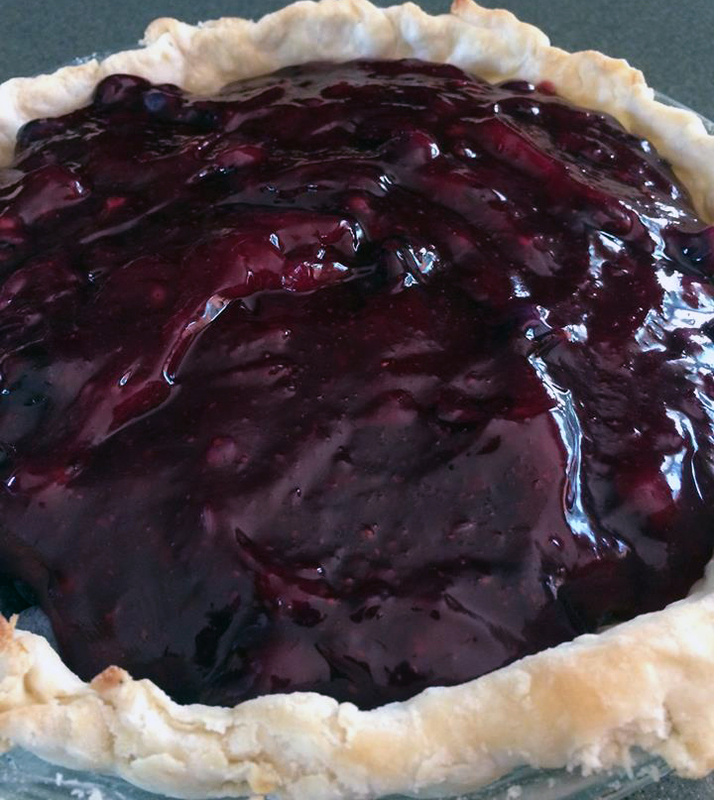 My favorite sweet use of this cheese is to blind bake a pie crust, spread the bottom of the pie with cheese, and then thicken two cups of fruit (peaches or berries are best) with sugar and corn starch, mix with two cups of fresh fruit, chill and fill the pie with the fruit filling. The thin layer of cheese adds a great tang to the taste of the pie, and it keeps the bottom crust from getting soggy. There are many places that sell cheese making supplies on line. I use getculture.com for all of my supplies: rennet, cultures, molds, etc. I get larger packages of cheese, yogurt and buttermilk cultures there. It saves on shipping, and the cultures keep for several years as long as you keep them well sealed and store in the freezer. To make the cheese, place one gallon of top quality milk (use goat milk to make chevre) in a non-reactive pot. I use stainless steel, anodized aluminum, enameled cast iron, or non-stick pots for this. Gently heat the milk to between 80F and a maximum of 100F. Remove the pot from the heat. Add 1/4t of mesophilic cheese culture. I have been mainly using the MM culture from getculture.com. Their MM culture is a mesophilic culture blend preferred for soft ripened, and fresh (unripened) cheeses: Brie, Camembert, Havarti, Gouda, Edam, Feta, Blue, Chevre, and similar styles. This culture creates a pleasant blend of lactic acid flavor and subtle buttery notes. I find it accentuates the fresh aroma of the milk, and is just assertive enough to come through when the cheese is combined with other ingredients to make a composed dish. Stir the culture in well. Next, add the rennet. You only want a very, very miniscule amount of rennet. The best way to do this is to dissolve the rennet in water and then use measured amounts of this water to add rennet to the cheese. I measure ½ cup of cool filtered tap water (de-chlorinated) and add three drops of rennet to this water. Mix in the rennet. Then I take 3t of this water and add it to my cheese pot. If you want the cheese to be softer, add less of the rennet solution. If you want it to be firmer (but be careful because the cheese can get dry and almost chalky), then add more of the rennet solution to the cheese pot. Stir it in well. Now just let the pot sit at room temperature for several hours. This can be done overnight. Over time the milk will take on a consistency like yogurt. 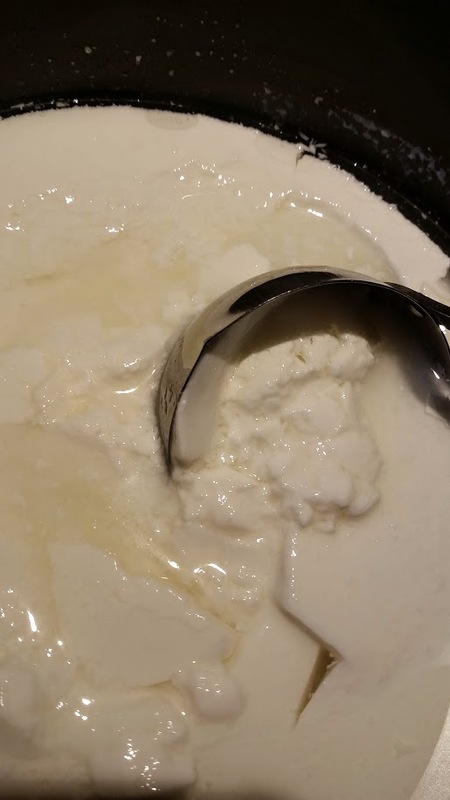 Ultimately you will see the whey separate into a clear yellowish liquid and the curd will appear as a soft white cylinder surrounded by the clear whey. At this point, the cheese is ready to drain. I have a muslin bag that came with my yogurt maker, but you can also just line a colander with some cheese cloth. Ladle the curds into the bag or cheese cloth lined colander. I put all of the curds and whey in there to make it easy. If you want to save the whey for another purpose, then place a container under your muslin bag or colander to catch the whey. Whey adds an interesting taste to breads if you use it in lieu of water. 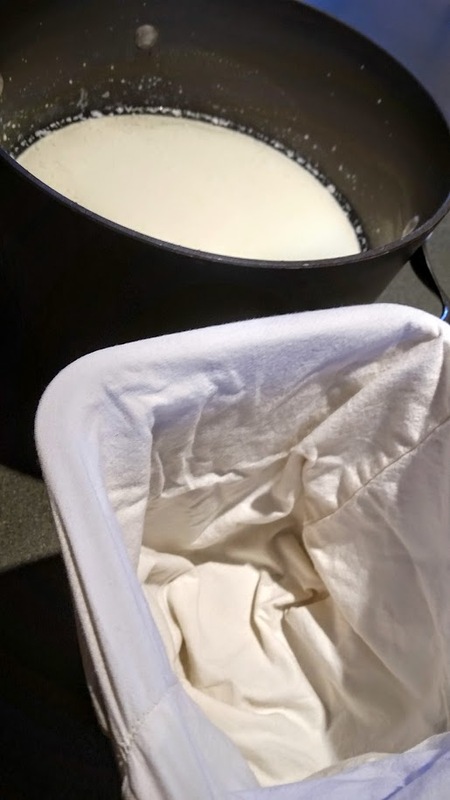 Hang the muslin bag (or if using cheese cloth, then gather the corners to form a bag) over a pot and allow to drain until the cheese reaches the consistency you want. This recipe makes about 5-6 cups of cheese. Scoop the cheese into a container and store in the refrigerator. You can also inoculate this cheese with Penicillium candidum mold and place into molds to ripen and make Camembert, but that is another story….